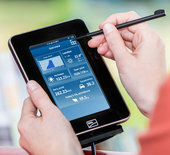 Below is a list of free solar calculators that can be used in the design of solar PV systems. These calculators are free to use or download, all excellent resources for anyone looking to install or understand more about solar PV systems. The PVGIS Estimation Utility is a great way to understand a proposed solar PV system's relationship with the sun based on it's location. If you have an understanding of this relationship as well as the access to the historical solar radiation data for your location that the PVGIS provides, you can prepare power output estimates (kWhrs), optimise system designs and have a very good idea of how a solar PV system will perform at a given location before a solar PV system is commissioned. Using this utility will give you the basic information needed to work out (1) the optimum pitch of a solar PV array based on it's location and height above sea level, (2) the amount of solar radiation available to a given location and (3) an estimated power output figure for your proposed solar PV system. Understanding the movement of the sun over a solar PV installation site is key to optimising the performance and power generation of a PV system, the PVGIS is a great tool to use for this. 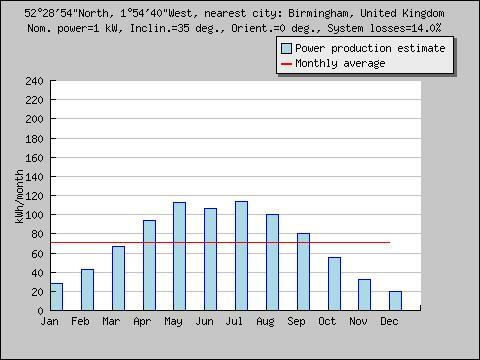 This tool underestimates the efficiency of modern solar panels and overestimates (default settings) the power losses that we would expect from a well designed solar PV array. 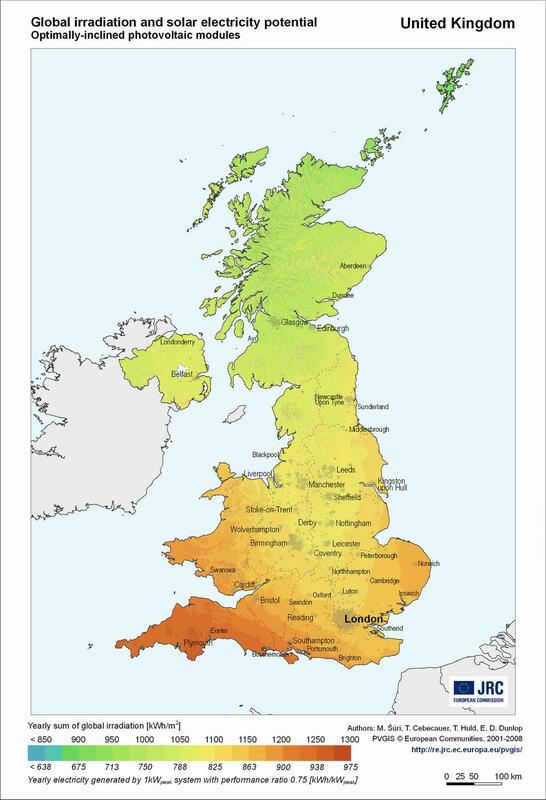 That said, when used as a tool to really understand what's going on between a solar PV array, it's location and the sun, it's superb. The Energy Saving Trust and Solar Juice have built a very neat solar energy calculator that factors nearly everything needed to get investment information for a small (sub 4kWp) solar PV system not just for anticipated solar PV system power outputs but also for real monetary returns in terms of Feed in Tariff payments, energy bill savings and exported energy. To use the calculator you will need to know the basic information about the PV mounting area, the proposed PV system size, an idea of monthly electricity bills and an estimated cost of the new PV system. Limited to solar PV systems under 4kWp, limited design choices, overestimates system losses, doesn't factor RPI FIT payment increases or predicted increases in electricity prices. However the tool is very easy to use and easy to understand, a comprehensive solar PV Return on Investment (ROI) tool and much more. SMA is the world's leading manufacturer of solar PV inverters and solar PV monitoring systems. SMA's Sunny Design software is a free to download and an incredibly powerful solar PV calculation tool. SMA Sunny Design software generates detailed .pdf reports based on simple inputs such as the number and type of panels used in the design, the basic location details, the aspect i.e. (N, S, E, W) and the roof pitch. The software also helps in cable size calculations to minimise power losses. A nice feature we have found when using this software is the ability to directly compare the performance of different solar panel types, makes and models directly against the details of the solar PV installation site. Most solar PV manufacturers panels and modules are already listed in the SMA Sunny Design database, you also have the option to input your own solar PV module data. Only applicable to solar PV systems that use SMA inverters. Location details are quite general, the design will be based on the solar radiation data available for the nearest large town to the installation site. Our very own calculator for working out roof layouts, solar panel numbers and system sizing. Decidedly low tech, but positive feedback from clients who use it has convinced us that it is useful, unique and worthy of being on the list. 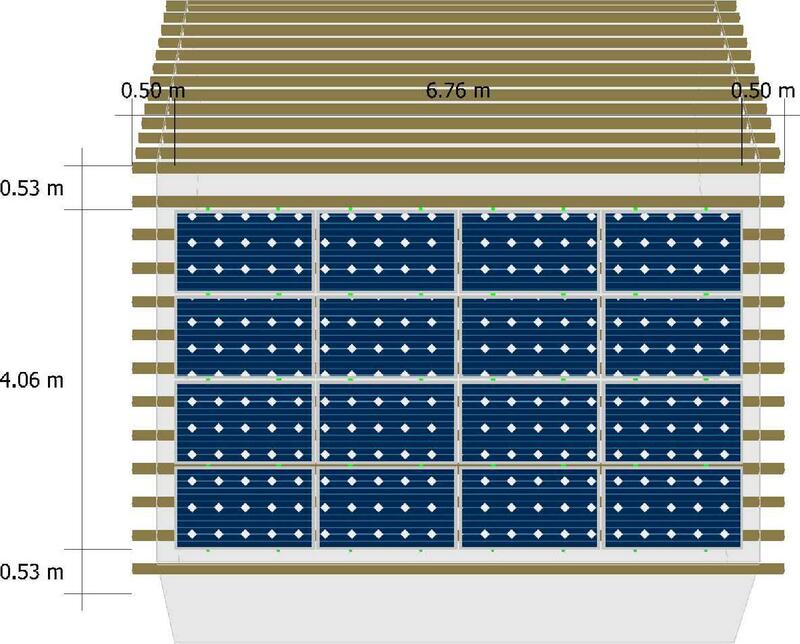 This calculator will help you to quickly work out how many large (60 cell) solar panels could fit onto a roofspace if the basic roof measurments (length x width) are known. In addition to module numbers, the range of different layouts that could be used in the system design are illustrated with pictures. 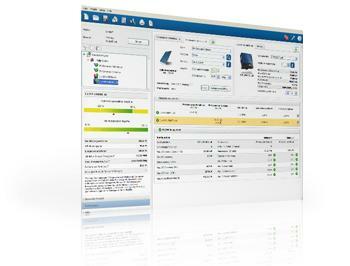 Figures are also provided for power outputs (kWhrs) based on SAP 2005 calculations. A helpful calculator that will provide the base information needed to get the most out of the calculators described above in relation to individual roofspaces. Will not give 100% accurate measurements for all large solar panels which come in a range of sizes. Unable to design non square PV arrays for example when mounting solar panels on gable ends. SAP calculations underestimate anticipated system outputs especially for systems installed in the south of the UK. The design tools and software listed below are free general tools that also lend themselves nicely to be used as solar PV system design tools. Google Sketchup is a fantastic free design and drawing tool that enables the user to create very accurate 3D models and drawings. The interface is intuitive and the program is very quick and easy to learn, much more akin to drawing on paper than you might find with CAD type programs. We regularly use Sketchup in our PV system designs and when designing custom components. Using sketchup is a great way to involve clients in the design process and illustrate how solar PV systems will look and integrate into properties before ordering. It also gives the PV system designer the ability to deal with every minor detail of an installation in advance, saving time and potential complications for the installers on-site. Very few limitations with the free version, the only reason we ever need to use Sketchup Pro (the paid for version, which costs around £350) is for the ability to convert 3D models to 2D for labelling and to accurately print to scale for planning permission documents etc. Nearly all the good stuff comes with the free version. Google Earth is a firm favorite of ours and a free software program that we couldn't do without. A huge amount of preparation work can be carried out in advance of a solar site survey using the aerial images and location details that are provided by Google Earth. Google Earth allows you to search for and zoom into a location using a postcode, an address, a town name, grid co-ordinates etc and see a detailed view of what's there from above (a satellite view). For those involved with solar installations nearly all the information and tools you need to know about a location pre-survey is available via Google Earth at the click of a mouse. We have been using this simple but effective free web tool for years. Always available with no annoying ads. Perfect for quickly working out roof measurements and roof pitches. Carbide Depot have also built a length, area conversion tool and loads of other calculators and tools to use when working with metal. Another free tool we have been using for years, unlike other cable size calculation tools this cable size calculator allows you to work with industrial sized cables and get the complete picture of how a specified cable will perform in terms of voltage drop, within its location and the proximity of other cables all on a single page. The most thorough cable size calculator we have found. MyElectrical has also built useful tools for conduit sizing and unit conversion.